What is DevOps and Related Certification Exams? DevOps is the combination of Development and Operations, which is used to facilitate communication, collaboration, and integration between development (application/software engineering), technology operations, and quality assurance (QA) departments. 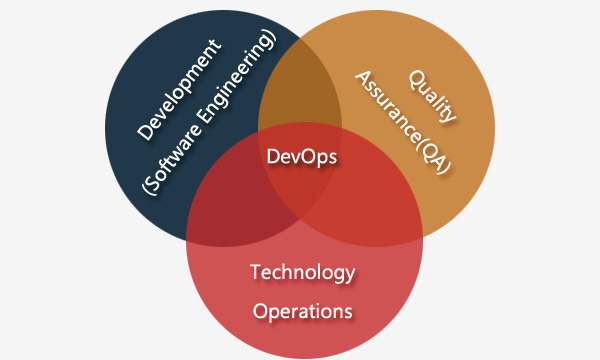 DevOps can be also seen as the intersection of the three subjects, showing them in the following picture. Traditional software organizations set development, IT operations, and quality assurance as separate departments. How to adopt new development methods in this environment is an important issue: according to the previous working methods, development and deployment do not require IT support or QA in-depth, cross-departmental support, but Extremely close multi-sector collaboration is required. However, DevOps is not just about software deployment. It is a set of processes and methods for communication and collaboration between these departments. The introduction of DevOps can have a profound impact on product delivery, testing, functional development and maintenance. In organizations that lack DevOps capabilities, there is a “gap” between development and operations—for example, operators require better reliability and security, and developers want infrastructure to respond faster, while demand of business users is to release more features to end users faster. This information gap is the most common problem. DevOps is often described as "a more collaborative and efficient relationship between the development team and the operations team." As the inter-team collaboration improves, the efficiency of the entire organization is improved, and the risk of the production environment with frequent changes can be reduced. There are also DevOps related certification exams available. Show some latest DevOps related certification exams below. People can choose the one which you would like to take and pass.